CLEVELAND, Miss. (Reuters) - U.S. Senator Elizabeth Warren was walking down a street in the town of Cleveland in the rural Mississippi Delta on Monday when she stopped to examine a small home's sagging roof. "You can be sure there's a lot of love in these homes. They just can't afford (to fix) it," state Senator Willie Simmons told Warren during the Democratic presidential candidate's three-day campaign swing through Mississippi, Tennessee and Alabama. "I'm running to be president of all the people, and it's important to go around the country and have a chance to talk with people face to face," Warren told reporters after a town hall that drew about 500 people to a high school in Memphis. Alabama and Tennessee are among the states holding their 2020 nominating primaries on the March 3 "Super Tuesday" following South Carolina's contest. Mississippi is set to host its primary in mid-March. All three states have sizeable black populations. 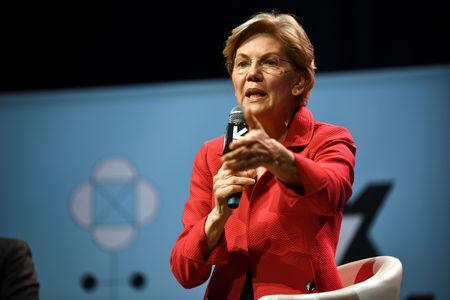 "Warren's biggest advantage in making this trip is that she will likely have the attention of a critical mass of African-American Democratic primary voters in a cycle where the black vote will drive the nomination process," said Democratic strategist Joel Payne, who managed African-American advertising for Hillary Clinton's 2016 presidential campaign. Many residents said they appreciated Warren taking the time to come and focus on their issues. On Tuesday, she planned to tour historic sites in Selma, Alabama, where the 1965 "Bloody Sunday" march marked a turning point in the civil rights movement. "Visiting helps. It lets the people down here know that somebody in Washington does care about them," said the Rev. Alice Crenshaw, 75, whose church marked the start of Warren's walking tour in Cleveland. "All people want is a decent job, to own their own home and be able to send their kids to school. We've got to know what you'll do for Mississippi," Miller-Foster said.